HOLLIE AND FIGGS ANIMATION - PART 3. HOLLIE AND FIGGS ANIMATION - POST 1 - MEET MAISIE GRANT. Story-time at Wigston Library in Leicestershire. Welcome to Hollie and Figgs! Hollie and Figgs are the main characters in a children's short story book series about a friendship between a young girl and her talking, magical cat. The books are relatable, fun and colourfully illustrated throughout. Aimed at young readers aged 5-8 years. The stories feature a young girl called Hollie, her cute fluffy grey cat Figgs and lots of magical beings. Hollie doesn't know that Figgs is magic and can talk until one day he takes her on an adventure to a kingdom where friendly creatures called Hippogoblins live and where magic takes place. The story books are charming, colourful and easy-to-read for the young reader or as a read-to story. They also address issues young children may face like moving schools and leaving friends behind in a creative and imaginative way. 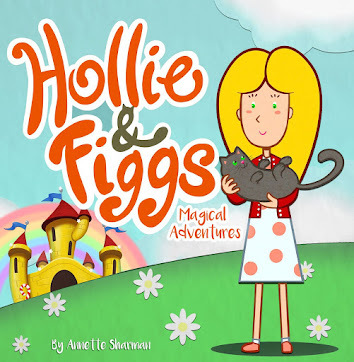 Follow Hollie and Figgs on their magical adventures and see their cute animation on the Hollie and Figgs website. Hollie and Figgs by Annette Sharman. Powered by Blogger. © Hollie and Figgs | All rights reserved.